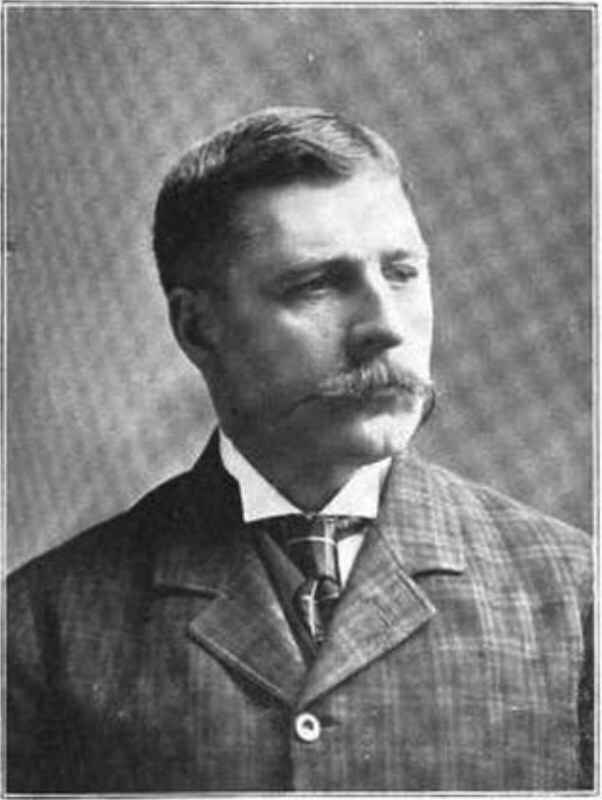 Today is the birthday of John D. McKechnie (October 21, 1849-February 14, 1906). He was the son of Alexander McKechnie, who along with Alexander’s brother James, the Scottish brothers founded the J. & A. McKechnie Brewing Co., d.b.a. 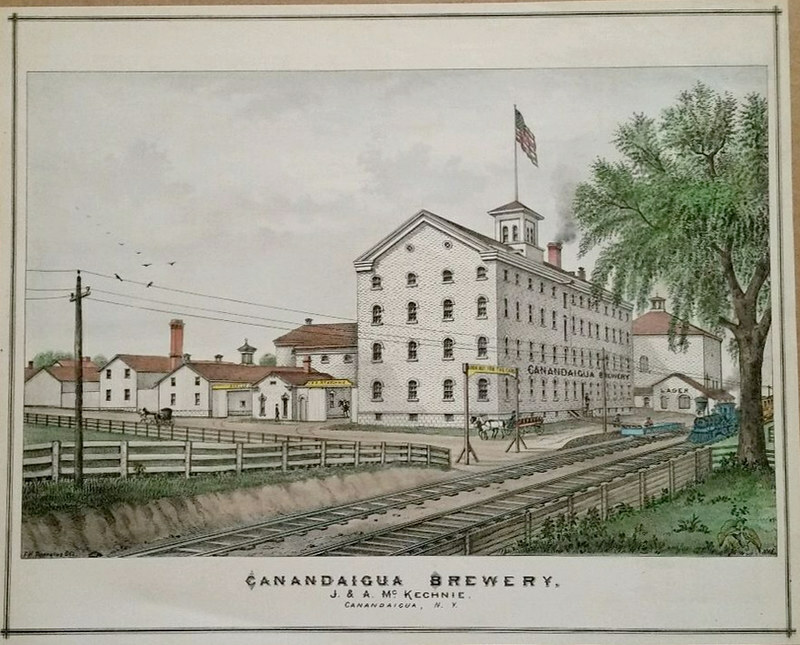 the Canandaigua Brewery, in 1843, in Canandaigua, New York. 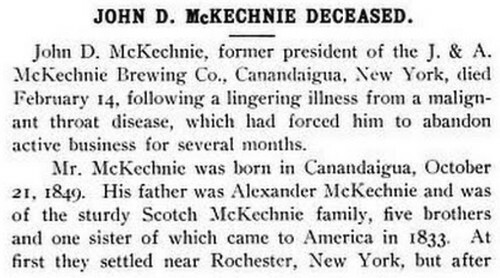 In 1889, after the last brother passed away, John McKechnie became president of the brewery, and it was renamed the simpler McKechnie Brewing Co., but closed for good at the start of Prohibition. In 1830, the McKechnie family left Falkirk, Scotland and emigrated to Canada, and from there to Rochester, New York in 1837 where the elder McKechnie with his oldest son set up a brewery business. Two other sons, James and Alexander McKechnie, left Rochester in 1843 and purchased a small brewery in Canandaigua on the site of what is now the Daily Messenger building on Buffalo Street. The Canandaigua Brewery grew steadily, producing a product that from its earliest days was noted for its excellence. 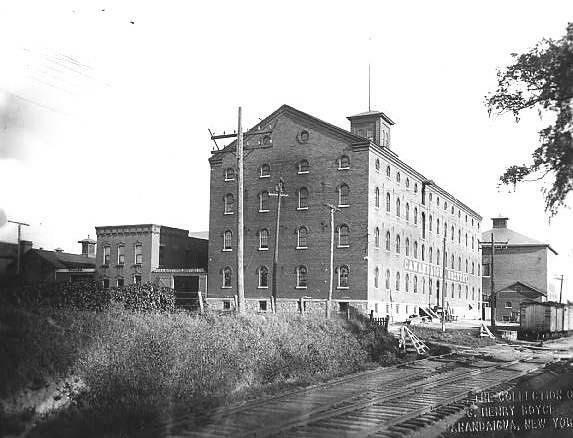 In 1871, the major buildings of the brewery were rebuilt and by 1876, the brewery had become the largest employer in Canandaigua with about 100 workers. The buildings covered over five acres of land and consisted of the brewery and storage block, malt-houses, a cooper shop, woodsheds, a barn for stabling horses, and three ice houses, which had the capacity to store 2000 tons of ice. While the brewery had the capacity of producing 500 barrels of beer each year in its early years, the capacity had grown to 1,000 barrels of beer per week. The McKechnies became involved in several other enterprises besides their brewery. In 1880 they founded the Canandaigua Lake Steam Navigation Company, which promoted shipping and tourism on Canandaigua Lake. The McKechnie Bank was organized in 1882 and later would become the Ontario Trust Bank. 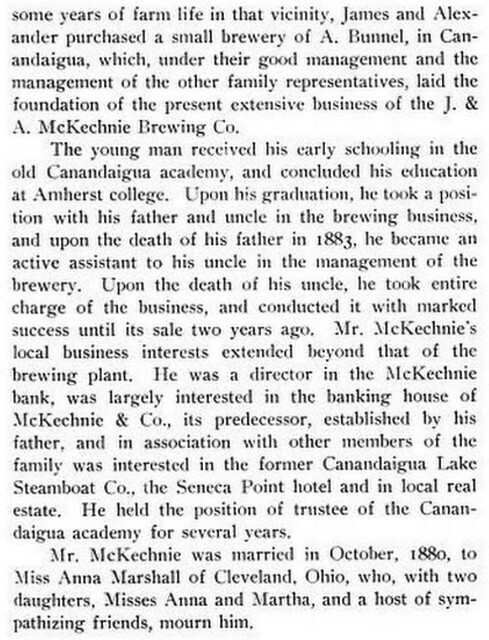 The McKechnies also invested in other businesses including the Canandaigua Gas and Light Company, the local ice houses, and area hops farms. Alexander’s son, John, purchased the Seneca Point Hotel on Canandaigua Lake and managed it until it burned in 1899. After the death of Alexander McKechnie in 1883, the firm was incorporated as a stock company renamed the McKechnie Brewing Company under the management of James McKechnie. In the production of its ale, the company used only the choicest hops and high-grade malt made from barley grown in Western New York, much of which was grown in Bristol and South Bristol. The hops and barley were brought by steamboat to the Canandaigua City Pier. 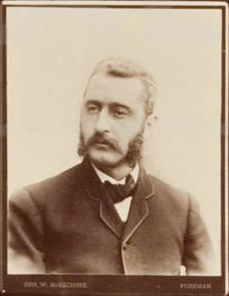 With the death of James McKechnie in 1889, the business was managed by John D. McKechnie, the eldest son of Alexander McKechnie. The stock company was renamed the J. & A. McKechnie Brewery Company. In 1904, the brewery was sold to Schopf Distributors located in Buffalo. The brewery was fully remodeled and concentrated on the production of its celebrated Canandaigua Ale. It had so excellent a reputation that shipments went as far west as Salt Lake City, Utah. The ale is said to have “such an excellent quality that it is widely recommended by physicians as a nourishing and healthful drink for invalids.” The yearly capacity of the brewery had reached 60,000 barrels. The refurbished brewery had a cooperage where the kegs and barrels necessary for handling the product were manufactured, and a large cold storage warehouse where large quantities of the choice fruit, mostly apples, grown in the vicinity of Canandaigua could be stored. The old-fashioned wooden tanks formerly used to store the ale were discarded and replaced with glass enameled steel tanks that ensured the purity of the ale. Throughout all the processes of manufacture and in all departments of the plant, the strictest cleanliness and attention to sanitary detail were observed. In 1916, with the advent of Prohibition in New York state, and in 1920, with the implementation of Prohibition nationwide, the J. & A. McKechnie Brewery was forced to close. In addition, the hops farms were hit with several blights in the early 1900s that effectively decimated the industry. For a brief period, the brewery attempted to survive on the production of pickles and vinegar. An attempt was made in 1933 by a Syracuse entrepreneur to reopen the McKechnie Brewery, but it never materialized. The Canandaigua Cold Storage & Ice Company occupied the buildings of the old brewery until it was sold to the GLF bean processing and dog/pet food manufacturing plant in 1940. On Jan. 1, 1961, the GLF plant burned, leaving a few remaining buildings on the site. Ironically, the McKechnie home on North Main Street where the American Legion had located in 1945 burned in 1960. Any remaining structures of the old McKechnie brewery were removed in 1971 when The Daily Messenger built its new facility on Buffalo Street.